What types of documents can the CT-550 Authenticate? 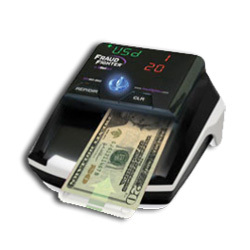 The CT-550 is designed for authentication of banknotes. Many of the world’s major currencies are available as software that can be installed onto the unit, for example, US dollars, Canadian Dollars, Euros, British Pounds, Hong Kong Dollars, Japanese Yen and more. How does the CT-550 work? What environments can the CT-550 be used in? The C-T550 is designed for use in high-volume transaction environments. Once a user learns how to feed bills into the CT550, they will be able to test up to 35 or 40 bills per minute. Although long-term continuous use of the machine requires that the CT-550 be plugged into an A/C outlet, the included Lithium battery does allow for use of the C-T550 remotely, in locations where no power supply is available.